Have you ever gone to a stand-up comedy show and had such a good time that you wished it would never end? Well, have we got a show for you! 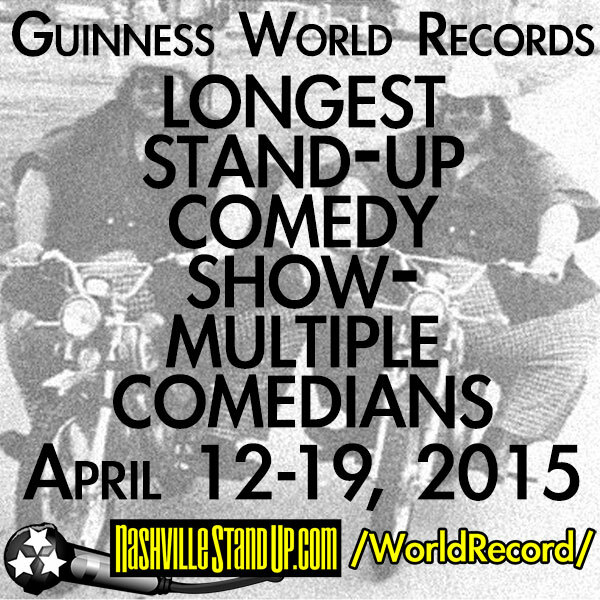 Beginning April 12, 2015, at The East Room in Nashville, TN, the NashvilleStandUp comedy scene, friends and special guests will attempt to break the Guinness World Record for the “Longest stand-up comedy show – multiple comedians.” The current record is 80 hours and was achieved by the Laugh Factory in Hollywood December 6-9, 2010. That show included 170 different acts by 150 comedians. We plan on breaking their 3.3 day / 80 hour record and continuing through the entire duration of the Wild West Comedy Festival until April 19th. That’s 8 days, 192 non-stop hours of stand-up comedy featuring as many talented comedians from as many places as we can manage. The brainchild of Nashville-based comic DJ Buckley, the Guinness World Records’ breaking attempt show will begin and end with The East Room’s weekly “Spiffy Squirrel comedy show“ with Chad Riden on Sunday nights & also include Tuesday’s regular “ULTIMATE COMEDY“ open mic and several other shows-within-the-show. The non-stop 192 hour schedule will feature showcases, feature length and headliner length sets and surprise drop-ins from comedians of various levels of fame and fortune AND infamy and misfortune. The Nashville Comedy scene wants nothing more than to put Nashville into the record books of comedy history, but we can’t do it without you. Comedy shows can be fun no matter how intimate the crowd, but this will certainly go much better with you there. Wait, what’s that? You can’t make it to Nashville, because you’re too far away and it’s expensive? No need to worry, we have plans to live stream the event. Yes, all eight days of it. We’d also love to film a documentary about all of this, too, but that’s going to take money.. and we are a group of poor dummies who thought it was a good idea to do comedy for a living. We do have smart, creative friends who are willing to help make all of this happen. We want to cover their expenses and gather the resources we need to do this right. We want to make laminates, print up swag and buy some SD cards for video cameras and be able to staff the venue and run the show non-stop for 192 hours! Also, there is a rather large fee to have the Guinness people send an official representative out to judge the world record attempt. WE WILL DO THIS NO MATTER WHAT HAPPENS, but we would much rather do it with your support so we can do it RIGHT. We have launched an IndieGoGo crowd-funding campaign to help pay for this event. Perks include VIP passes, special silk screened show t-shirts, limited edition Hatch Show Print show posters, even chances to perform on stage and be included in the Guinness book of world records. Also, you’ll have an all-access pass to see multiple hosts and hundreds of comics driven to madness by a relentless amount of comedy as many times as you want. Nashville StandUp is a non-profit organization (more specifically, a 509(a)(2) Public Charity) with a mission to cultivate and promote middle Tennessee’s growing stand-up comedy scene and the Nashville-based comedians that help make it a success. Check your qualified income tax professional about the tax deductible status of your charitable donation. Some dumb comedian bails on his set and walks off or doesn’t show. The East Room is destroyed by terrorists who hate freedom and comedy. We’ll have an Emergency Back-Up Comedian on deck at all times. We will rise from the ashes and continue to sling zingers in the debris. – Please help get the word out and make some noise about this. – SHOW UP at the show! We need butts in the seats. Everybody will be much more comfortable with a full audience. – Join the NashvilleStandUp.com mailing list & follow us on Facebook, Twitter, Instagram & YouTube. – Steal money from some richie rich person who doesn’t deserve what they have and THEN contribute with THAT money. Wherever you live, go find the local comedy shows and comedians and support them. The super famous incredible “breakout” comics of 10-15 years from now are trying standup comedy for the first time ever this week and you could be there to see them. Want to attend or perform on the show? Visit the IndieGoGo page for details. Thank you very much for donating and we hope to see you at the show!